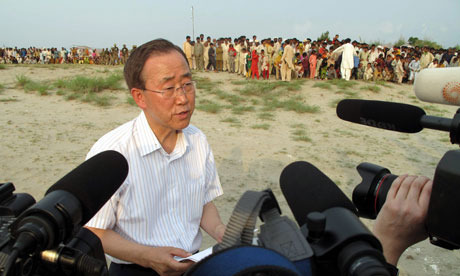 Today United Nations Secretary-General Ban Ki-moon said that the flooding in Pakistan is nothing like he has ever seen before. He met with Pakistan's president, and both men pleaded with the world to increase their aid to the nation suffering from the deadly flooding disaster. The spectacular remains of a 5,000-year-old city and the grandiose mausoleum where the former prime minister Benazir Bhutto is buried are directly in the path of the rampaging floods in Pakistan, officials have warned. The floods swallowed up fresh areas of Pakistan over the weekend, as the government said 20 million people were now affected by the disaster. A case of cholera was confirmed, raising the spectre of an outbreak of the disease, with thousands of those affected by the floods showing the symptoms of acute watery diarrhoea.